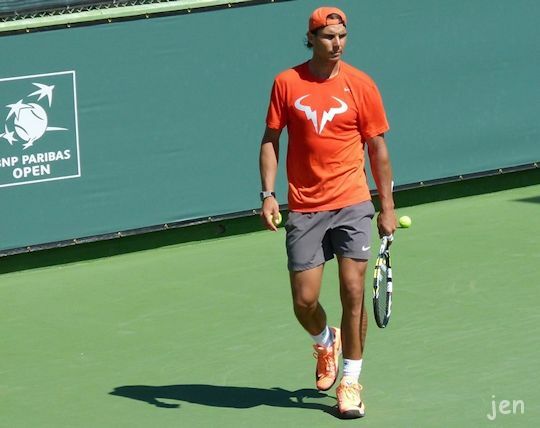 Five of us got together to share a house in Palm Desert so we could see Rafa at Indian Wells. We'd come from Texas, North Carolina, Missouri, East Sussex and Oxfordshire, which adds up to quite a few air miles, so it wasn't that great to have him lose halfway through our stay. 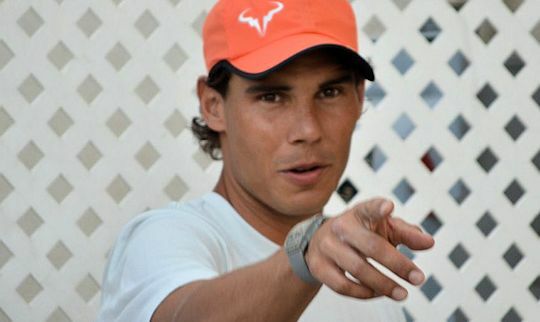 However, just in case anyone was starting to feel sorry for us, there is always much to be savoured when Rafa is at a tournament. These are just some of our reasons to be thrilled and privileged to have been here. We got lovely close-up views of Rafa when he unveiled his mural. 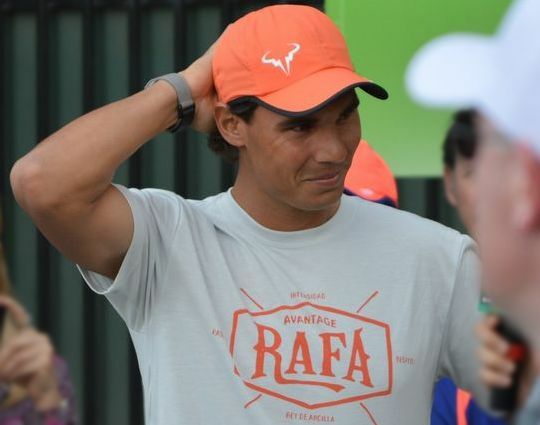 OK, we weren't that impressed with the artwork but Rafa was just smiley and gorgeous. There's just an outside chance that he spotted us. 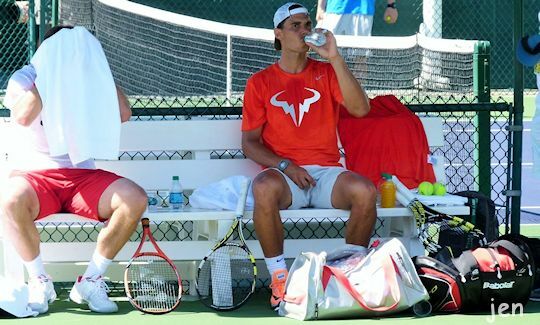 We sat in various positions around the court for about 12 hours of practice sessions. 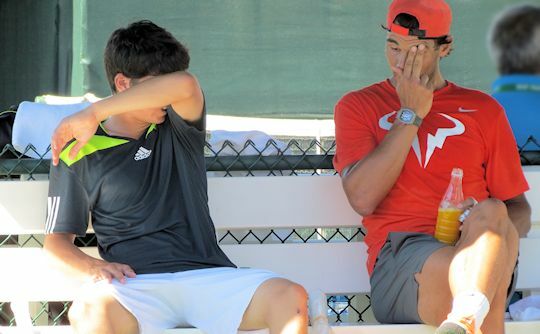 There were assorted hitting partners ranging from top ten players down to juniors. 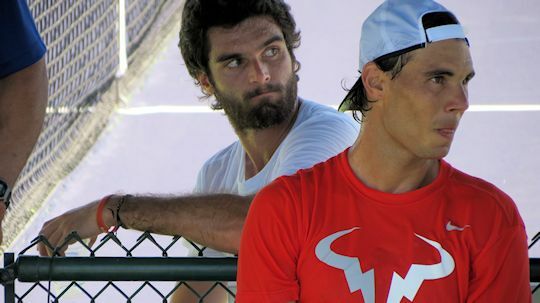 Making Pablo Andujar sit behind. Stanislas Wawinka doing the decent thing. Tommy Robredo taking over shirtless duty. Long into the night with Pablo Carreno Busta. Final warm-up with 17 year old Bernardo Oliveira from Brazil. This gave us a chance to see the very tricky manoeuvres involved in getting the new one on. 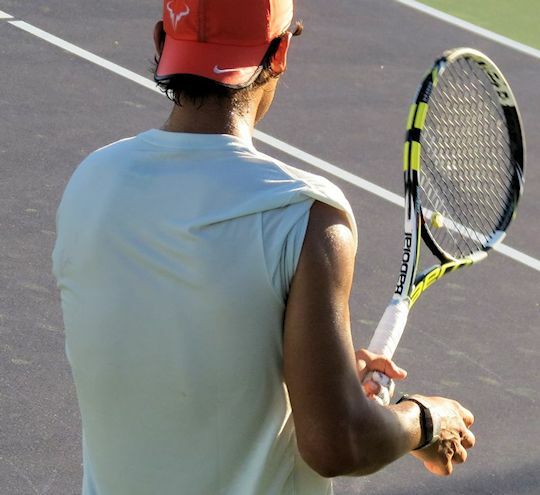 At one practice he gave us faint hope that he might just hit a few balls while remaining shirtless. We got a glimpse of sleeveless. There were lots of smiles like this one. 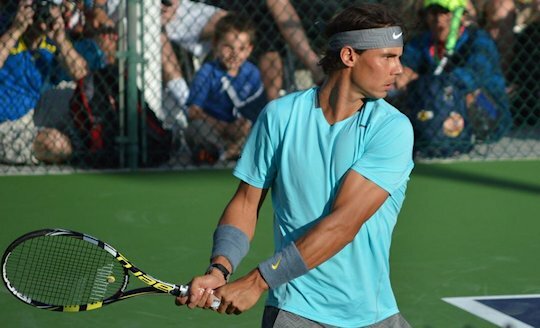 These hours of watching Rafa made all the money and effort we expended worthwhile. It is impossible to convey the sheer presence of the man. 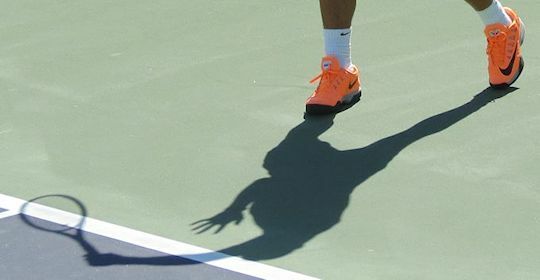 Whether in full flight on the court or just ambling across to practice, everybody's eyes are drawn to him. He is magnificent and, win or lose, he will always have our support.